Nowadays, Australians are more interested in prime cut beef than cheap cuts. This can be caused by various factors and I think it’s mainly because that prime cuts are easy to cook with flavours and tenderer meat. I don’t deny this and I am a fan of prime cuts as well. Who isn’t? The point I am trying to make here is that people shouldn’t be afraid of cooking cheap cuts. Although some cheap cuts can give chewy and hard to bite meat or overly strong in flavour, these problems can be overcome with correct cooking method and techniques. In my previous post, the restaurant did very well with the offal and a minute steak which is a cheap cut. 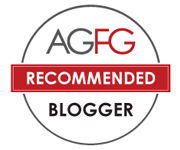 Today, I am putting two easy to follow recipes up on beef short ribs. Many people are scared of this type of cut, but if you follow these two easy recipes, I am sure your meat will be much tastier and as tender as many prime cuts. This is probably one of the widely recognised dish of Korean cuisine. After pan-frying or roasting, the excess oil has been released from the meat, which tastes juicy and delicious with garlic and fresh pear flavour. Serving with fruit salad is ideal for this dish. Freshly cracked pepper – depending on your liking, I used 1/3 tbsp. 1. Soak the beef spare ribs in cold water for 2-4 hrs until the color of the meat became white. Dry the meat using paper towels. 2. 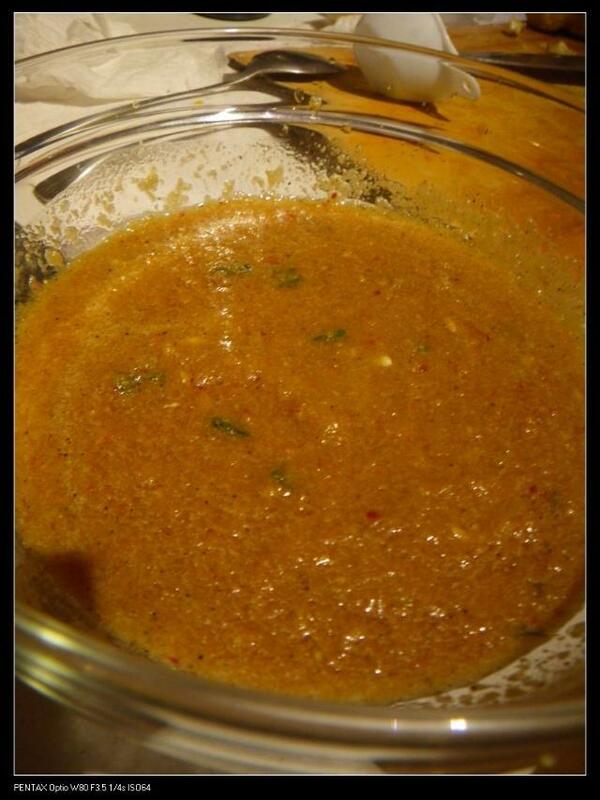 Mix 1 Asian pear and 1/2 onion in a blender with small amount of water and blend to made a paste. 4. Place the dried beef short ribs in the marinade and mix well to make sure all ribs are covered with excess amount of marinade. Cover the mixture with cling wrap and leave in fridge for at least 4-6 hrs. 5. Place the beef short ribs, covered with the marinade, into a preheated oven at 160 oC for 20 mins until golden brown. Now the ribs are ready to be served. 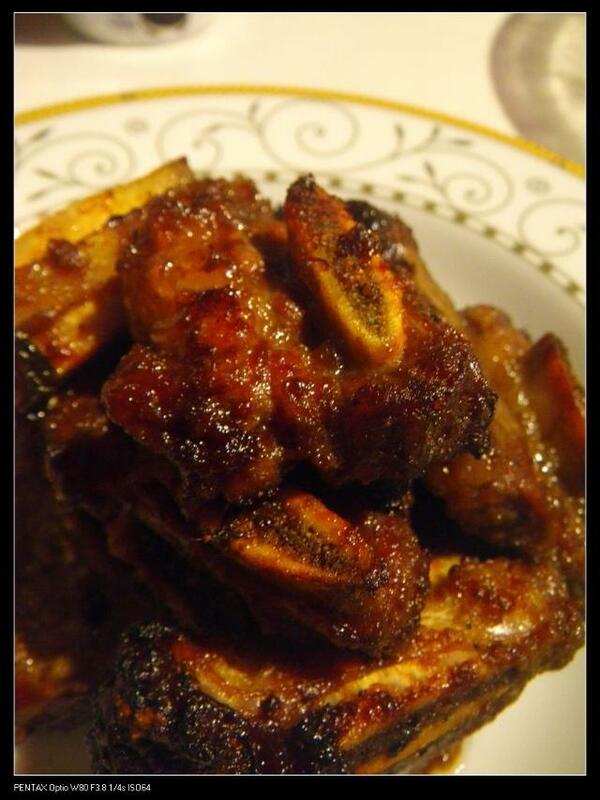 Note* – Many people use pan to fry the ribs after marinating. You can do this but it will get the ribs blackened quicker and hard to cut. Roasting the ribs at a rather lower temperature can help to preserve the juices and hence give tender and moist beef short ribs. The same golden color can be achieved because of the outer marinade cover which creates a beautiful light crust on the meat. In terns of flavours, the beef short ribs are very tasty with most of the distinctive features of beef as well as strong pear and herb flavours. Yummo! 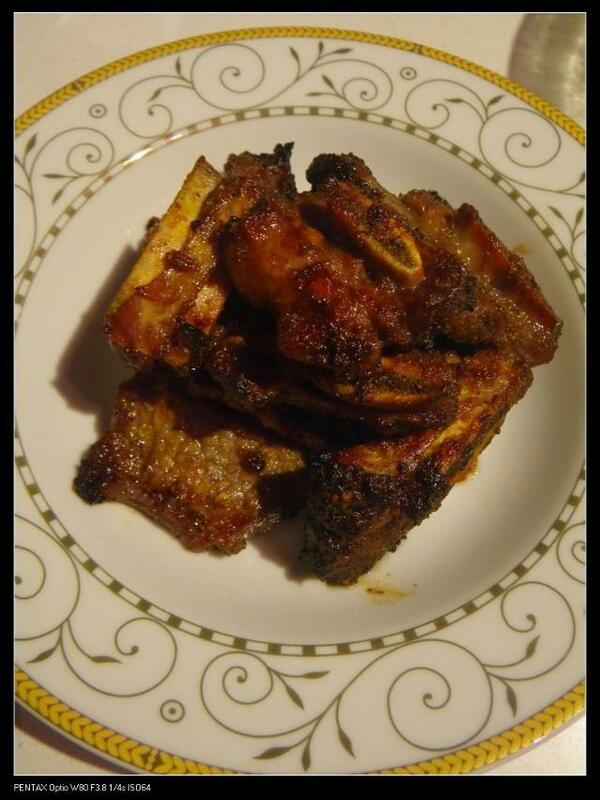 The short ribs can be enjoyed on their own as finger food or can be served with fresh crisp salad with orange pieces. This recipe is even easier than the above one but it will make your dish even tastier than inappropriately cooked prime cut beef. 1. Cut the meat off the beef short ribs. 2. Use a meat tenderiser/hamper to pound the bulky meat to flat and thin. 3. Season with salt and pepper and rub in a layer of corn flour. 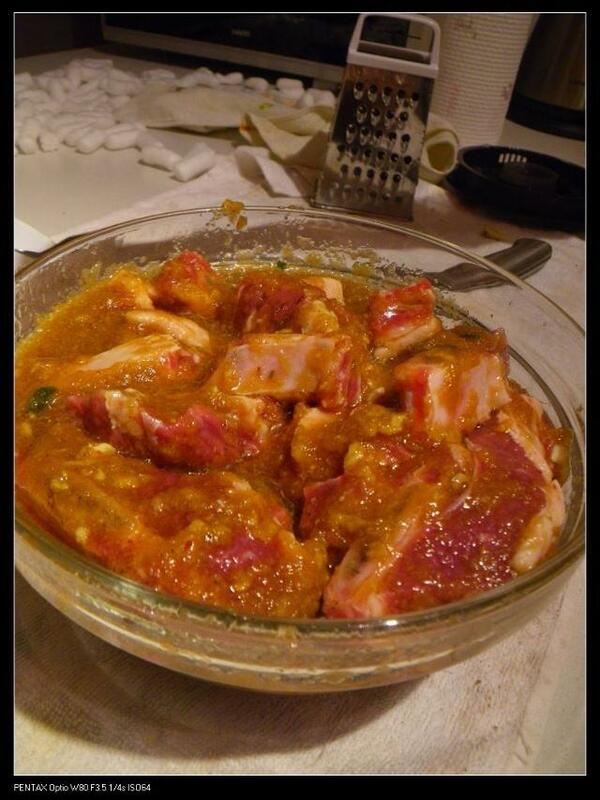 Make sure the meat is covered with corn flour and leave for 5 minutes to tenderise the meat. 4. Dip each pieces of the meat in to the beaten egg and then cover with bread crumbs. 5. Fry the beef at high heat for 30 seconds to stablise the shape and then fry medium heat for 5 minutes until golden brown. Turn the heat up to high to cook for further 30 seconds to extract most oils out of the mini schnitzel. Cook the rest of the beef and drain excess oil on a rack or paper towel. 6. 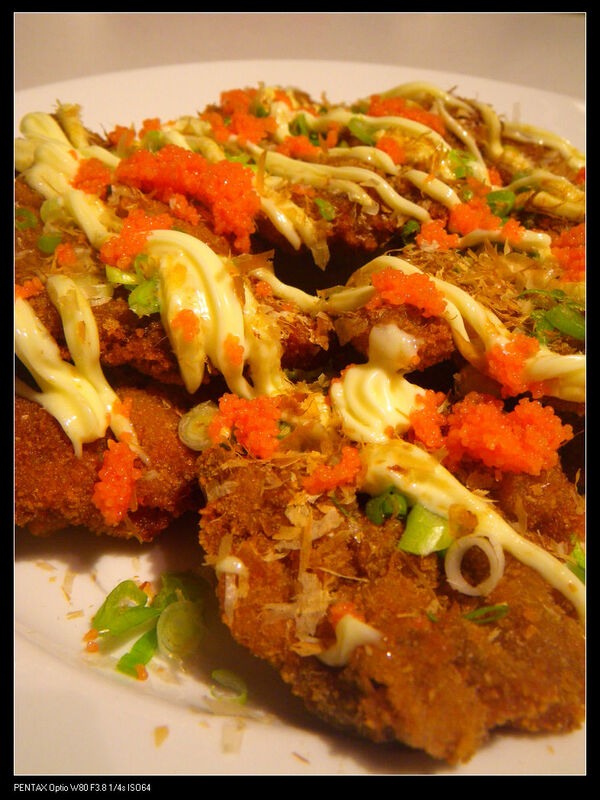 Top the mini beef schnitzels with kewpie mayonnaise, finely chopped spring onions and shredded bonito pieces and fish roe caviar to serve. The amount of each items are up to your liking. Obviously, I served them in a large plate but if you want, this can be a good starter or entree dish. Plating is up to you and you don’t have to use caviar. The meat, after frying, is very tender and full of moisture. Each bite of these mini schnitzel can have loads of juices entering your mouth and at the same time the mayonnaise and caviar gives sour, creamy and fishy flavours. 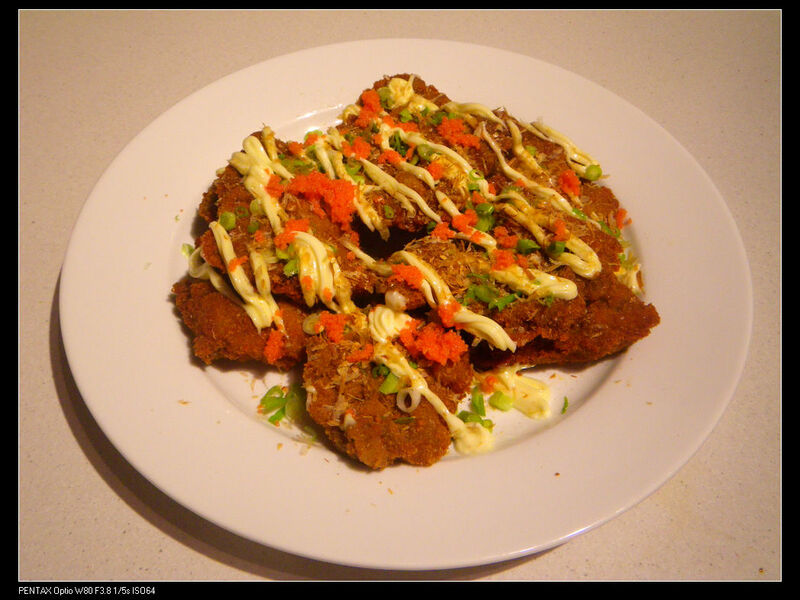 The fine texture of the beef and the crunchiness of the outside together with the melting bonito pieces is much much better and tastier than our normal schnitzel from a good cut. Try it! G’day and thank you! Your recipe and photos look YUM, TRUE! I love when meat literally falls off the bone and thought the secret ingredient was baking soda in the marinate too! Thanks for letting me know about the baking soda, Joanne! I normally just cook things with bones in my electric pressure cooker for several mins and then cook using other method, but sometimes the marinade tastes may not go fully into the meat in this way.